Claude Williamson, a West Coast jazz pianist who was deeply influenced by the bebop piano of Bud Powell and was perhaps the last surviving member of the Lighthouse All Stars, often unleashing centipede-like speed on the keyboard along with sinewy improvisational lines, died July 16. He was 89. His son, Marc, said last night that his father never fully recovered from a bad fall in February 2015 and had been in hospice care for about a year. Like many jazz musicians associated with the West Coast jazz movement of the early 1950s, Williamson was from the East Coast. Born in Brattleboro, Vt., he played piano in the territory band led by his drummer father that toured the southern part of the state between 1940 and 1944. In 1945, Williamson studied at the New England Conservatory of Music in Boston. Williamson's younger brother, Stu, was a trumpeter who would become prominent in several major big bands led by Stan Kenton and Woody Herman, and in small groups in the 1950s; he died in 1991. Claude Williamson's teacher at the New England Conservatory was Sam Saxe, who convinced him in 1947 to move to Los Angeles, which was emerging as a significant studio recording center. To earn money over the six-month period before receiving his Los Angeles musician's union card, Williamson played gigs where he met other key musicians who would become instrumental in his career in the 1950s. In 1948 and '49, Williamson played piano in Charlie Barnet's band, notable for its bebop recording sessions for Capitol in 1949. 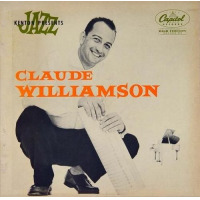 While with Barnet, arranger Manny Albam wrote a piece for Williamson entitled Claude Reigns that showcased Williamson's bop chops. In 1950 and '51, Williamson was June Christy's accompanies, appearing on the recording of A Mile Down the Highway in 1950 and on the Snader Telecriptions that same year with the Ernie Felice Quartet, which are up at YouTube. From 1951 to 1953, Williamson served in the Army in the Pacific. When he returned, he took over Russ Freeman's chair as the house pianist at Howard Rumsey's Lighthouse in Hermosa Beach. While employed at the Lighthosue, Williamson played with virtually all of the major musicians who would come to dominate the West Coast jazz scene. In 1955, he left to join the Bud Shank Quartet, which toured overseas. In addition to his work at the Lighthouse, Williamson was an in-demand jazz studio player, recording with Dave Pell, Chet Baker, Pete Rugolo, the Lighthouse All Stars and many other headliners. Throughout the '50s, Williamson recorded upward of four studio sessions a month. In the late 1950s and early '60s, he was featured on several leadership albums. Recording slowed in the 1960s and early '70s as television work in Los Angeles picked up. He worked a range of TV variety shows as a conductor, composer and arranger, notably on the Andy Williams Show, Sonny and Cher, and Donny and Marie. His studio recording pace slowed in the 1980s and '90s, with his last known album, 52nd St. Revisited, being recorded in February 1996. With the death of Howard Rumsey in 2015, Williamson is likely the last of the Lighthouse All Stars. Overall, Williamson, along with Hampton Hawes, infused West Coast jazz with pure bebop. But Williamson also could stretch out on songs with a breathtaking technique that was all his own. As a sideman, musicians such as Bud Shank favored Williamson's driving piano underneath them while singers like Christy favored Williamson's classy swinging feel and chord voicings. Williamson was the last link to the early days of LP jazz recording in Hollywood. Claude Williamson is survived by his wife, Deanne, and sons Marc and Shawn.